Celebrating the additional funding news at Moree’s Grace Lutheran Preschool, Back, left, Chukwuebuka Aniakor, Northern Tablelands MP Adam Marshall, Louis Greenwood. Front, Kristian Phillips, Jayden Msanzu and preschool director Megan Fleming. 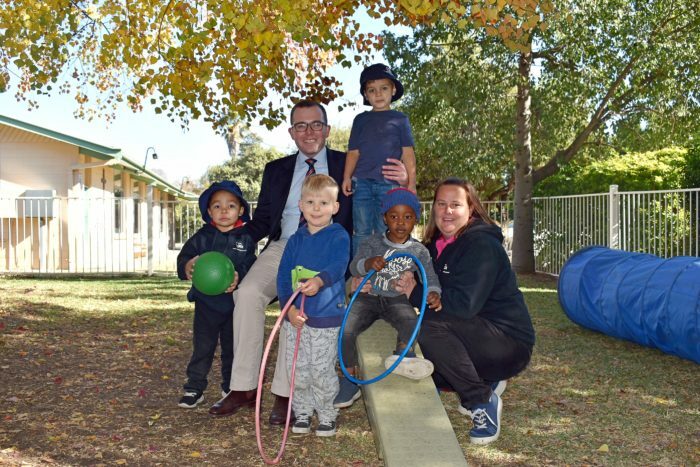 THE youngsters at Moree’s Grace Lutheran Preschool are looking forward to some big changes after Christmas this year, thanks to more State Government funding, announced today by Northern Tablelands MP Adam Marshall. The first of some new goodies in their wish list at the preschool will be a whole new floor for their entire building in Jones Street. Mr Marshall announced a $13,259 grant for the preschool to re-floor the whole building and make it more functional and flexible for the students to play and learn in. “The funding from the Quality Learning Environment program will allow the preschool to replace outdated carpet and lino flooring that has been down about 20 years,” Mr Marshall said. “The flooring there now isn’t user-friendly for some of the activities that the kids undertake, like painting, and that restricts good early education. Preschool director Megan Fleming says they will install new flooring hopefully by the end of the year that will give the building a more homely feel and better suit modern preschool activities. Mrs Fleming said the flooring funding is the latest big news for the centre. It will also undertake major extensions later this year provided through a $500,000 NSW Government capital grant announced by Mr Marshall late last year. “It’s an exciting and very busy time coming up but it will be fantastic for our preschool community and their needs,” Mrs Fleming said. Mr Marshall said Grace Lutheran Preschool had been operating since 1983, but some major changes were on the way that will see the building almost double in size. “Grace Lutheran currently has 29 children, aged from three to five years old, each day in the centre but the extension will allow them to have another 20 children each day in the new space,” Mr Marshall said. The new building will be constructed opposite the current preschool space on the opposite side of the playground and hopefully be ready for occupation for the New Year. It will also enable the centre to capitalise on the government’s recent announcement to provide full subsidies for three-year-old preschool students from next year.